Google’s gone gesture-happy with a big revamp of its search app for the iPhone and iPad. Previously known as Google Mobile App, the new and improved Google Search still offers quick ways to forage through the Web with your thumbs, voice, or camera. But new gestures bring flexibility to your search and the app’s interface: you can now swipe to the right to filter your search results for types of data like images, news, and discussions. A downward swipe will bring you back to the main search area with access to voice search and Google Goggles. If you use other Google iOS apps, such as Google Voice or Google Translate, a large Apps button at the bottom of the main search area will let you quickly find and switch to those, as well as provide direct access some of Google’s Web services, like Google Reader or Gmail. You can rearrange and customize which apps appear in this list. Google says it also made improvements other parts of the app, including Search with My Location, Gmail’s unread count, and more. 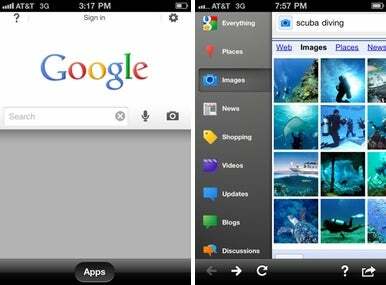 The Google Goggles feature also now supports the iPhone 3G and iPod touch (Google is unspecific about which iPod touch, but I believe Google means the fourth-generation model, since Goggles requires a camera). And for those who find themselves confused by the new layout, Google even provides a handy help overlay to assist users in discovering all the features. Google Search is available now in the App Store for the usual price of Google products. It’s a universal app that requires iOS 3.0 or later.